For more information, e-mail socialstudies@esc4.net or call 713.744.6355. Interactive activities for American history that can be used before, during, or after initial instruction. SUPPORTING ACHIEVEMENT IN U.S. HISTORY– NEW! Interactive activities for U.S. history that can be used before, during, or after initial instruction. Teach students to think about American history like a historian–through an inquiry-based approach! This resource offers 30+ instructional routines to support content assessed on the Grade 8 Social Studies STAAR®. 5 Es over America provides instructional activities and multiple forms of assessment to monitor student progress. $50. ORDER ONLINE | Download a sample. Teach students to think about Texas History like a historian–through an inquiry-based approach! This resource offers 30+ instructional routines to support Texas History content and address foundational components assessed on the Grade 8 Social Studies STAAR®. 5 Es over Texas provides instructional activities and multiple forms of assessment to monitor student progress. $50 per copy. ORDER ONLINE | Download a sample. 5ES OVER WORLD CULTURES – COMING SOON! Teach students to think about World Cultures through a conceptual lens! This resource offers 50+ instructional routines in a two volume set to support World Cultures content through a conceptual approach. 5 Es over World Cultures provides instructional activities using a 5E Model and multiple forms of assessment to monitor student progress. Email socialstudies@esc4.net to be added to our mailing list and receive word as soon as this resource is available! 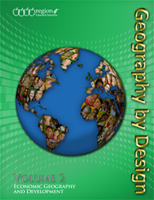 Teach world geography through a conceptual approach. Build vocabulary and improve instruction for English learners using classroom-ready, content-specific activities. Unwrap the TEKS for planning lessons that meet the cognitive demands of the social studies curriculum. Strong instruction is the foundation of great classrooms. These highlighted sessions offer in-depth training opportunities for both general and special education teachers interested in ensuring TEKS-aligned, quality instruction to meet the needs of all learners within the core content areas. Search these terms online or click here for a full calendar of upcoming professional learning opportunities from Region 4 Social Studies.